Hugh Patrick Wallace passed away peacefully Sept 22, 2013 with his family by his side at the age of 91. He was born in Seattle Jan 29th, 1922 to Michael Wallace and Bridget Curran. 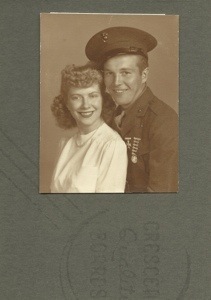 Hugh married the love of his life, Betty June Thorburn Jan 30th, 1943 and shortly after joined The Marines, serving in the 4th Division where he fought in the Central and South Pacific and survivedthe battle of Iwo Jima. After serving his country, Hugh returned to Seattle where he remained active with the American Legion and served as a Commander of the American Legion Post 160 and VFW Post 2713. He worked in construction as a heavy equipment operator until his retirement. Hugh and Betty were blessed with eight children, all who remained in the Seattle area. Pat [Sheri], Kathi[deceased], Barbara, Linda[George], Patty, Mike[Shari], Sue[Greg] and Terry, 17 grandchildren and 16 great grandchildren. Hugh and Betty’s love story inspired us all and they shared a wonderful life together traveling, making many trips to Nevada and Eastern Washington and spending time with the little “schmoes” as he affectionately called all his grandchildren and great grandchildren. Hugh also enjoyed gardening and sharing his homegrown tomatoes with family and friends. Betty passed away August 8th ,2011 and Hugh will finally reunite with her once again. Hugh will be deeply missed by all his friends and family. Service is Saturday, September 28, at the Chapel of Providence Mount St. Vincent, 4831 35th Ave SW, at 10:00 AM. Reception to follow at 11am at the VF W in West Seattle 3601 S.W. Alaska St, Seattle, WA 98126.